Future of Shade Archives - Delray Awning, Inc.
Construction: Vinyl laminated on Milicor(R) scrim base fabric with 1000 denier yarns anchored by 70 denier yarns. Surface Treatments: Customspun(TM) and Rain Kleen(R). Pro’s: Water, mildew and abrasion resistant. It has extra strength with manageable weight for superior resistance to sag and stretch. Fabric is 100% watertight. Fabric is easily cleaned and maintained. Fabric is flame resistant to Califormia State Fire Marshall Standards. Con’s: Over time can crack and harden. Weight: 14.5 ounces per square yard. Guarantee: Manufacturer’s five year limited warranty. 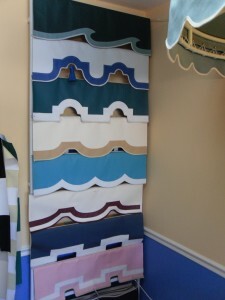 Styles: 33 solids and 44 stripes with same pattern on both sides. Construction: Solution dyed woven fabric made of 100% acrylic fiber. Surface Treatments: Water repellent finish. Pro’s: Does not shrink, crack, peel or harden. Not affected by mildew or rot. Comes in bright and vibrant colors. Ask us about Sunbrella Sun Protective Performance fabric that has a UPF of 50+ and has been awarded the Skin Cancer Foundation Seal of Recommendation. Con’s: Fabric in light colors may stain and be difficult to clean. Fabric is not watertight and will leak in areas that are in contact with framework. Fabric is not resistant to sag and stretch. Weight: 9.25 ounces per square yard. Guarantee: Manufacturer’s ten year limited warranty. 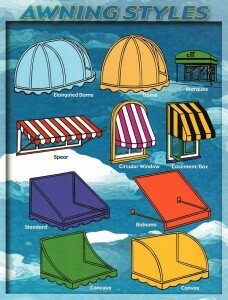 To checkout the different patterns and colors available from Sunbrella click >>> Sunbrella Shade Fabrics. Sunbrella partnered with Architizer, the largest online community of architects and designers, to crowdsource the latest thinking on shade innovation. To view this video on YouTube click >>> Future of Shade.